After hitting the target with its debut last month, Jordan Brand is looking to make more noise this August 2011 with the release of another colourway of the Air Jordan 2011 Q Flight. 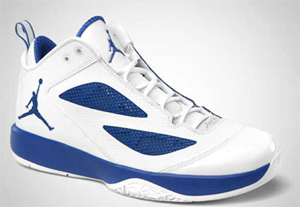 Released in five colourways last month, the Air Jordan 2011 Q Flight, which was said to be made for speedy guards and fast-cutting wing players, will come in White/ Varsity Royal colourway this August. Featuring a Hyperfuse-based design, this shoe is made up of white upper and outsole accented with touch of Royal Blue on the upper part, the Jumpman logo, and the midsole. Looks impressive? Watch out for it this month and don’t dare miss it!